While I (and every sane person) preferred the thrust stage of the elegant Swan Theatre to the dated Art Deco proscenium and cavernous auditorium of the RST, there was something about Elizabeth Scott’s 1932 creation that merited a degree of reverence and respect – not only because it had won prestigious design awards, but also because this was the temple in which the greats of British theatre had acted and re-enacted their sacred Shakespearean ritual: Olivier, Gielgud, Richardson, Redgrave, Scofield, Ashcroft, Leigh, Dench… To walk quite literally in their footsteps and intone in that same ‘empty space’ the greatest verse ever written was both moving and profoundly humbling. While the great cavern is no more, the holy of holies remains: the apron of the old proscenium is now augmented with its own thrust, and the audience gather around it on three levels. This gives more opportunity for what Terry Hands used to call ‘Swan acting’: as the audience surrounds the stage, so the actors surround the audience, making their entrances and exits around and through. Gone is the gulf between player and groundling: in the stalls, you can touch the hems of their garments and feel their spit upon your face. As it is in the Swan, and as it was in Elizabethan England, the spectators in the RST are now, gloriously, made participants in the action. Michael Boyd’s production of Macbeth is unnerving and harrowing: from the moment you enter the auditorium, the evil is present. Tom Piper’s apocalyptic design takes you right to the post-Reformation era of iconoclasm, following the dissolution of the monasteries and the destruction of great Gothic cathedrals. With vandalised statues, defaced images of saints, shattered stained-glass windows and a massive crevice in the wall where once would have hung a giant crucifix, we are instantly in a world of political trauma and religious division: the profane has triumphed and the sacred has been expunged. And in the vacuum lurks a darkness quite unlike any Macbeth I’ve seen. Boyd’s brilliance lies in his capacity to surprise: just when you anticipate the wearily familiar – witches, spells, cauldrons and measured soliloquies – he hits you with some truly haunting and quite spectacular moments which are completely unexpected. And so we begin not at the occultic beginning with black and midnight hags, but straight into the politics and reports of war. All are in Jacobean black, bar the saintly whiteness of Duncan, played with omnia rex majesty by Des McAleer, who is every inch a king. And then Boyd hits us with his first shock as three zombified children fly in, suspended like hanging corpses from a gallows. Ingeniously, these innocents resurrect later as Macduff’s children – his ‘pretty chickens’ – only to be slaughtered. As I was trying to work out the paradox in the space-time continuum, the spurting blood rendered the pursuit otiose. The dead are omniscient and ubiquitous: the darkness is ever thick with their ghostly, claustrophobic presence, whether or not the structure of the play is compromised. And these children are superb – both disturbing and mesmeric: at one time cherubs with angelic voices; at another, disembodied spirits controlling diabolical dolls, as though demons pulled all the strings. They are truly children of the damned. Jonathan Slinger’s Macbeth is a studied characterisation with credible development. If that sounds non-committal, it’s probably because I’m still making my mind up about it. At the outset, there’s a certain lack of warrior-king stature and oratorical credibility that this “brave Macbeth” could ever brandish steel or inspire his sergeants to believe he could threaten like an eagle or raw like a lion. Yet after his coronation (bizarrely a baptism with water rather than an anointing with oil), the sparrow does become more of a bird of prey. But even with his blonde locks it’s not quite a bald eagle. Slinger does have some moments of brilliance: his “To-morrow, and to-morrow, and to-morrow” is hypnotic, with more than a hint of Hannibal Lecter about it. He doesn’t ask for fava beans and a nice Chianti with Banquo’s fried liver, but he leaves you in no doubt that he’s depressed, disturbed and dangerous. And the banquet with Banquo’s ghost (played twice) is utterly horrific (from Macbeth’s point of view, before the interval) and then disturbingly comic (from his wife’s perspective, straight after the interval). Aislín McGuckin’s Lady Macbeth is somewhere between a block of ice and a ring of steel. She could credibly take a baby from suckling at her breast to calmly dash its brains out. 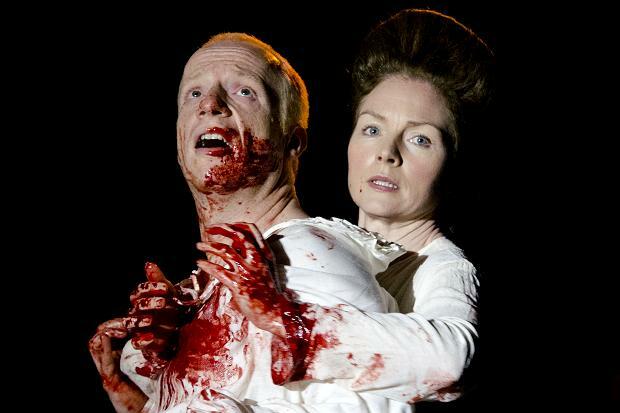 Both Macduff (Aiden Kelly) and Lady Macduff (Caroline Martin) merit a mention: he for his very emotional shift from loyalty and love to suspicion and inner torture; she for making a usually peripheral role into a very memorable character, especially at the slaying of her children. Steve Toussaint’s Banquo is like an African blackwood, his swashbuckling dreadlocks distracting ever so slightly from whatever he’s saying. Jamie Beamish as Seyton (aka the Porter) is excellent light relief as a suicide bomber sporting a belt of gunpowder; just as you’re lulled into thinking the powder is damp, another jolt of Boyd explodes in your ears. This Porter even ad libs (i.e. uses Boyd-scripted deviation from the text) with the groundlings (“never return to a lit firework”) as Shakespeare’s clowns were wont to do. And the ever-present trio of cellists provide eerie melodies (composed by Craig Armstrong), maintaining a haunting taste of Hell. Scott Handy’s Ross is a charismatic chameleon, adopting various functions and guises throughout the play: his voice soars in a beautiful rendition of ‘Pie Jesu’ that wouldn’t have been out of place at the recent beatification of Pope John Paul II. But Howard Charles’ Malcolm was on another plane altogether. There aren’t many actors who bother to cry when they’ve got eight shows a week to play, but Charles really had “tears in his eyes, distraction in’s aspect”, and certainly those seated up close could not but be moved by his sincerity. It is testimony to Drama Centre London that they are still producing such emotionally authentic actors. This Macbeth invades the moral senses; it is evil, distressing and malignant. The triumph of good and the restoration of the religious and political order under King Malcolm do nothing to alleviate the image of the horror. Michael Boyd has brought up the curtain on a splendid season of renewal: he is leading the RSC through a new period of strategic evolution rather than seismic revolution. And this production is a thrilling baptism for this magnificent new space. This entry was posted in Arts & Culture and tagged Acting, Aiden Kelly, Aislin McGuckin, Arts, Caroline Martin, Craig Armstrong, Culture, Des McAleer, Drama Centre London, Elizabeth Scott, Elizabethan, Howard Charles, Jacobean, Jamie Beamish, John Barton, John Caird, John Gielgud, Jonathan Slinger, Judi Dench, Laurence Olivier, Macbeth, Michael Boyd, Michael Redgrave, Paul Scofield, Peggy Ashcroft, Ralph Richardson, Reformation, RSC, Shakespeare, Steve Toussaint, Swan Theatre, Terry Hands, Theatre, Tom Piper, Vivien Leigh by admin. Bookmark the permalink.